Mark this date for posterity: we have officially entered The Future. A company called James Law Cybertecture International (Special Projects) Ltd (whose terrible name we will overlook) has announced a product called the Cybertecture Mirror: Reflective window into a digital life. 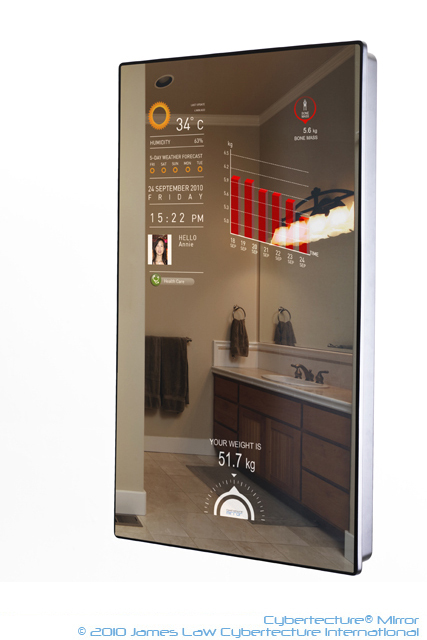 The “mirror” aspect of this product is that light reflects off its surface to provide users with a picture of themselves. This technology has been known to mankind for generations. But the “cyber” aspect is that it’s an Android-powered computer that can project onto the mirror’s surface realtime data like the weather, the owner’s current (and historical) weight, and messages from various social networks. And, being Android-powered, the extensibility is almost endless. Now when you wake up and face your mirror in the morning, you can — as has been dreamed in decades of science fiction — see an up-to-the-minute picture of the world at large. The only downside I see is that some percentage of the people you contact on Facebook may now be answering while naked after getting out of the shower. And that’s just a little creepy. HA! You posted this on Nov 9th and today is the 13th. I am already in the future. But, sadly, this device appears to be based on he metric system which means it is doomed. Americans will always see themselves in pounds, not kilometers or whatever those Euro-babes use to measure their skinniness.